We've built motors in 10 minutes, but this one really does go together in 30 seconds or less. You can time yourself once you have all the pieces in front of you. A battery. A D cell, a C cell, or an AA cell -- any will do. A disc magnet. Silver plated would be best, if it didn't tarnish, but gold doesn't have that problem. Nickel plated will do, but it won't work as well. The plating must conduct electricity. A length of stranded wire, such as from an alligator test lead. A sharp pointed wood or drywall screw. It must be magnetic, and it must conduct electricity. Set the screw in the center of the disk magnet. Cut the alligator test lead in half, and strip the insulation from the last inch of the cut end, so the strands of wire spread out like a brush. Hold the alligator clip against the flat end of the battery. 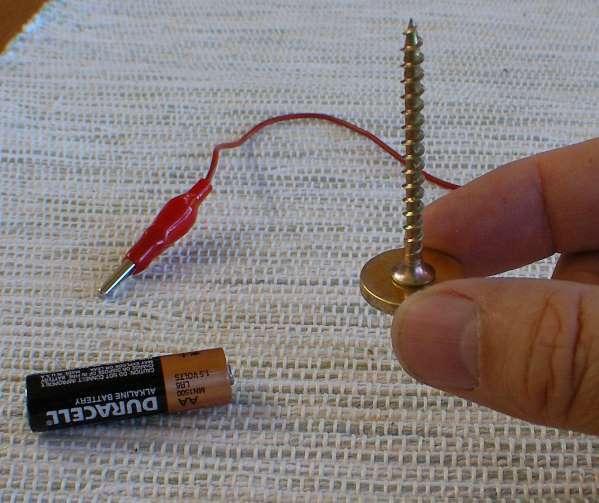 Bring the button end of the battery to touch the point of the screw, and lift the screw and magnet an inch off the table (the screw will stick to the battery because of the magnet). Gently hold the brush end of the wire against the edge of the magnet. Stop the timer, since the screw and magnet are spinning around like crazy. The science behind the homopolar motor is described on the previous page. Order a kit to build this toy from our catalog.